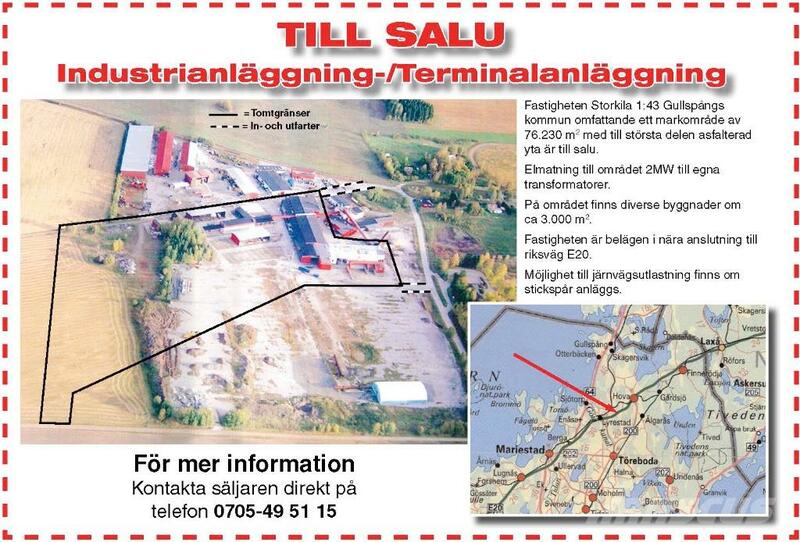 Más información The Storkila property 1:43 is situated in Hova in the municipality of Gullspång in Sweden. The land area is about 76230 square meters with mostly paved surface. The power supply to the 2 MW area to own transformers. In the area there are various buildings, about 3000 square meters. The property is located near the highway E20. Possibility of railway unloading is available if a secondary track is being built. If you are seriously interester, please send and e-mail to sales@kinnemaskinteknik.com with your questions and we will reply a s a p.
Fastigheten Storkila 1:43 Gullspångs kommun omfattande ett markområde av 76,230 m2 med till största delen asfalterad yta är till salu. Elmatning till området 2MW till egna transformatorer. På området finns diverse byggnader om ca 3.000 m2. Fastigheten är belägen i nära anslutning till riksväg E20. Möjlighet till järnvägsanslutning finns om stickspår anläggs.